Mankind has become a victim of his own education that prefers to ingest a supplement (opposed to ol’school exercise, water & kool-aid) ? to help us loose weight, lower blood pressure and control a long list of medical conditions that did not exist ten years ago (are should I say, we as the consumer didn’t know about it), because the government never discloses everything. I’m talking about Ketones and how people are jumping on the band-wagon because it’s easier to drink a boat load of Ketones opposed to the old fashion way. Suzanne Massie, a writer in Russia, taught President Ronald Reagan an old Russian proverb between 1984 – 1987, that’s still good today and always will be, “Trust, but verify“. So, let’s do a little homework and see what the doctor has to say about Ketones, what they are and how they work. The “keto” in the word ketosis comes from the fact that it makes the body produce small fuel molecules called “ketones”.1 This is an alternative fuel for the body, used when blood sugar (glucose) is in short supply. Ketones are produced in the liver, from fat. They are then consumed as fuel in the body, including by the brain. This is important as the brain is a hungry organ that consumes lots of energy every day,2 and it can’t run on fat directly. It can only run on glucose… or ketones. Now that’s a good question but the answer is even better. Here’s what the doctor has to say about the benefits. By giving your body and brain an almost unlimited supply of energy, you can increase your mental and physical endurance. It also reduces hunger, facilitating effortless weight loss. Furthermore, as getting into ketosis requires eating very few carbs, it can effectively reverse type 2 diabetes. Ketosis has also been used for a long time to control epilepsy – often even without drugs. Even beyond this, it’s showing great promise for several other conditions, like improving acne, reversing PCOS and perhaps even treating brain cancer. How do I jump start my Ketones? 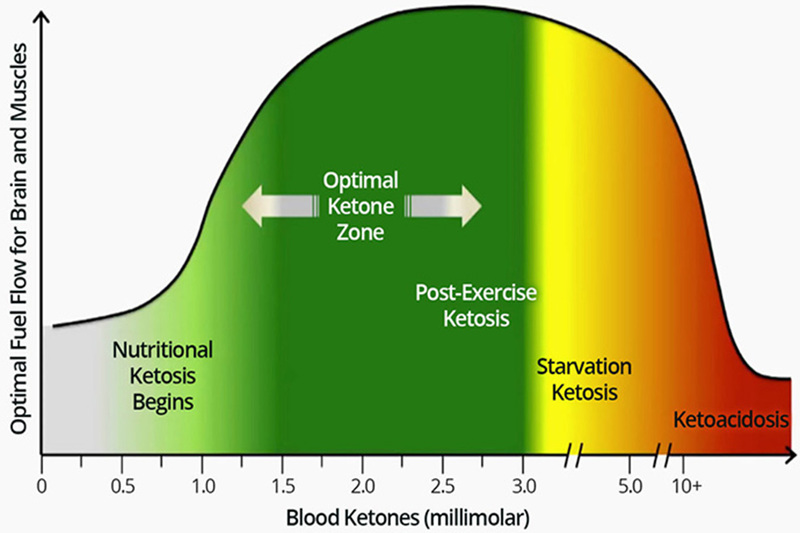 To get into ketosis you need low levels of the fat-storing hormone insulin. The most important way to do that is to eat a strict low-carb diet, also called a ketogenic diet. On top of the necessary ketogenic diet there are many ways to increase ketosis further. The most powerful is adding intermittent fasting.